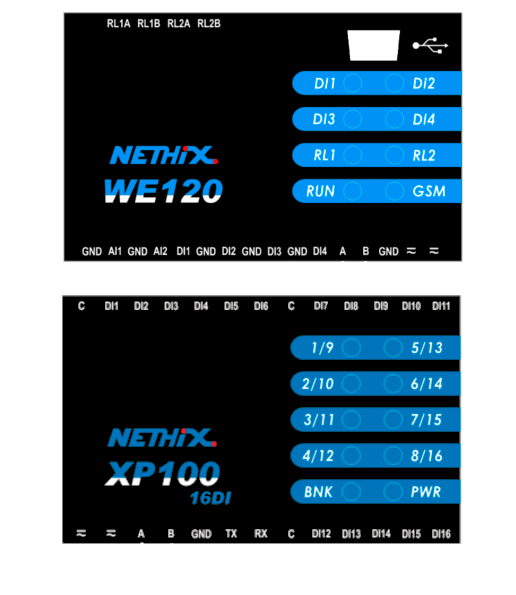 The XP100 product line includes a complete range of smart expansion modules for Nethix remote control devices. They are developed for the integration with Nethix WE120. The communication between the modules and the host is made through a standard communication protocol, that is Modbus RTU compatible on RS485 multipoint line. The XP100 devices interface directly with most of the common process signals (tensions, currents, temperatures etc..) and contain the necessary circuits for acquisition, for signal conditioning and for analogue-to-digital conversion. 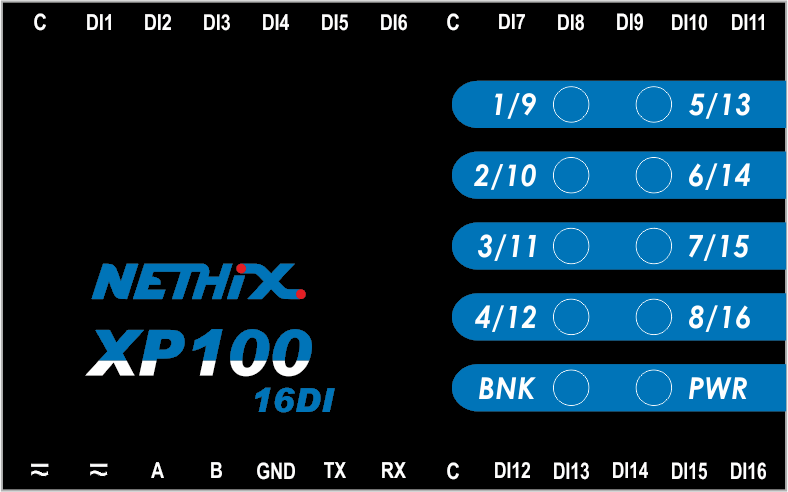 Digital I/O Expansion with 16-Inputs: includes 16 PNP/NPN isolated digital inputs. This document presents all necessary technical information for the installation and the operation of the XP100 expansion modules. For a proper use of the devices it’s recommended to read carefully the present sheet. The information contained in the present document can be updated at any time without notice. Dimensions 90 x 70 x 60 mm. To operate on the dip-switch placed on the board. To put in communication the expansion and the software Genesys, through a WE120. 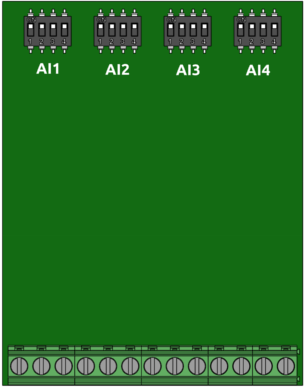 Every dip-switch (composed of 4 pin) is linked to an analog input (the dip-switches are sorted like the input ports). This allow to set up every dip-switch indipendently from the others. 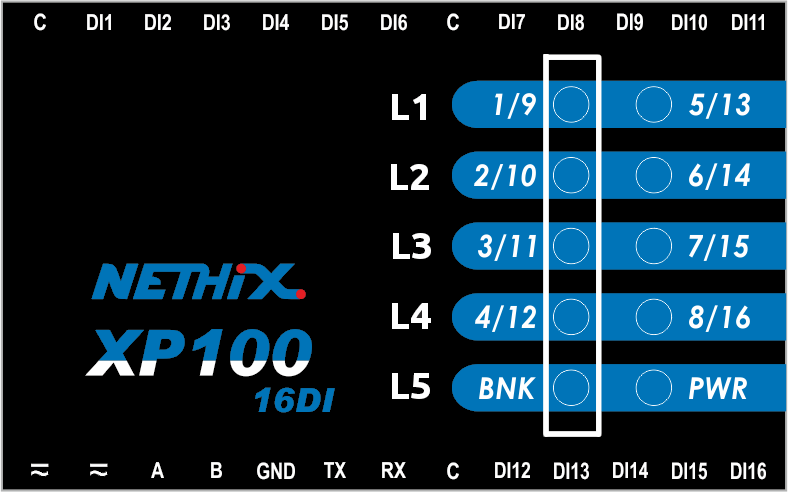 It is possible to set up every inputs in 5 modes: 0-5 V, 0-10 V, 0-20 mA, PT100 o NTC. Once that the inputs are configured, it is necessary set up the XP100/4AI-4T with the Genesys. This operation allow the WE120 to read the values in the right way. Connect the XP100 to the WE120 and supply the power to both fo them. Run the configuration software Genesys . Select Expansion from the menù on the left side. Select 4 analog input black in the field “Type”. Fill the field Modbus address with the address of the expansion (refer to 6.2. Setting the slave address). In the section Analog input configuration select the proper set up for each input. Save the configuration using the button Save. 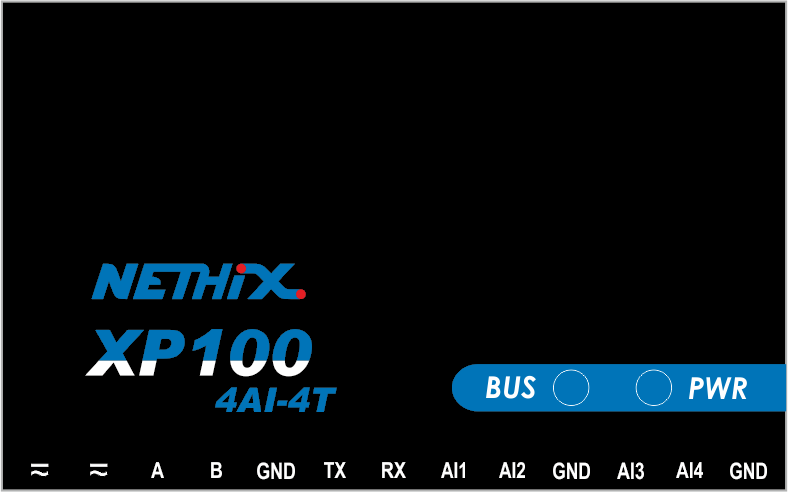 Entering in Genesys is possible to select the XP100/4AI-4T, from the list of the expansions connected to the WE120, and change the configuration of its inputs at any time. -20 and 80 must be setted respectively as minimum and maximum in the case of inputs configured as NTC and PT100. 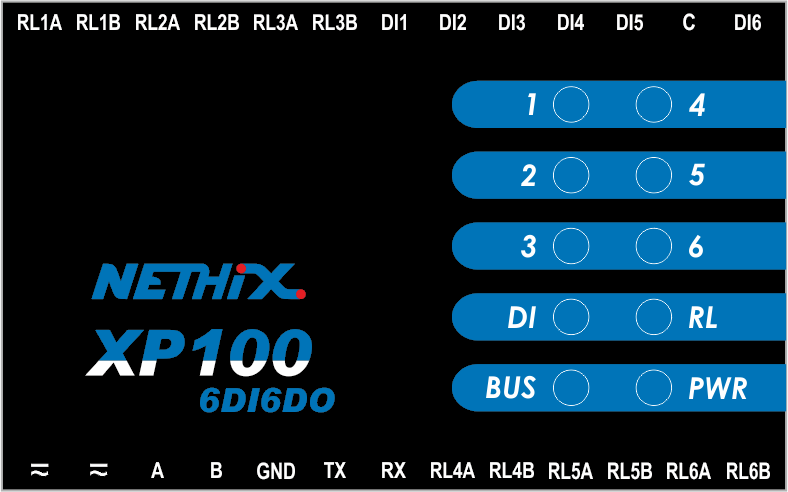 It is important that the set up made by Genesys must be supported from the dip-switches configuration, otherwise the WE120 will read wrong values. Before use, all devices must be configured and identified on the network through a unique slave address. Lift the upper panel of the device using a screwdriver, in order to reach the electronic board. Power the device and wait a few seconds until the end of the initialization procedure. Push briefly the small button on the left.  The display shows the current slave address of the device, represented by the lighting of the leds 1-5 in binary code. The PWR led blinks slowly. Press and hold the configuration button for a few seconds. The PWR led starts to blink fast. Each time you press the configuration button, the address is increased by a unit. Repeat this operation until you reach the desired address. Finally press and hold the button, in order to save the selected address. In order to change the address assigned to the device, it’s allowed to repeat the above mentioned procedure at any time. The slave addresses assigned to all the XP100 expansion modules connected to the same R485 network must be unique. It’s not possible to assign the same address to more than one device. On the upper container of all XP100 modules is available a DIP-SWITCH with 4 different positions, that allows to change the hardware configuration of the device. BUS (status)- when blinking, inidcates that the Modbus/RS485 communication is in progress. On, it indicates that the leds 1/9-8/16 show the status of the DI1-D18 digital inputs. The simultaneous blinking of all the leds indicates a malfunction of the device: in this case please contact Nethix Technical Support. Nethix products are designed for typical use in industrial automation and/or home applications. If you plan to use Nethix products in special applications where anomalies and discontinuity of service can have serious effect on human life or can cause physical or material damages, or where extremely high levels of reliability are required (for example in aerospace systems, in atomic energy control systems or n electro-medical devices), please contact Nethix for support to your particular application. Nethix is not responsible of damages caused from its products if such applications are not previously authorized. The product shall not be treated as household waste. It shall be instead handed over to an appropriate collection point for the recycling of electrical and electronic products. For further information about recycling of this product, contact the local city office and/or the local waste disposal service. Nethix warrants to the buyer that the product will be defect-free within two years (24 months) from the date of purchase. During warranty time, and against presentation of purchase invoice, the product will be repaired or replaced, at Nethix’s discretion, without any additional costs as regards spare parts and repair, if the damages are proven to be manufacturing defects. Warranty will be voided if the product has not been used properly. Product return to NETHIX must be previously authorized, requesting a RMA number. Nethix will communicate the RMA number, in order to start the return procedure of the product. The delivery of the goods shall be arranged DDP at Nethix premises. Products returned without factory seals will be automatically treated as out-of-warranty repair services.